The UN General Assembly is holding its first World Conference on Indigenous Peoples. Yvonne Bangert from the Society for Threatened Peoples is convinced that Germany needs to do more in this area. DW: When we talk about indigenous peoples, how many people are we talking about and in how many countries? Yvonne Bangert: Various estimates exist, ranging from 350 to 400 million people. There are 7,000 indigenous peoples in total, across all continents. 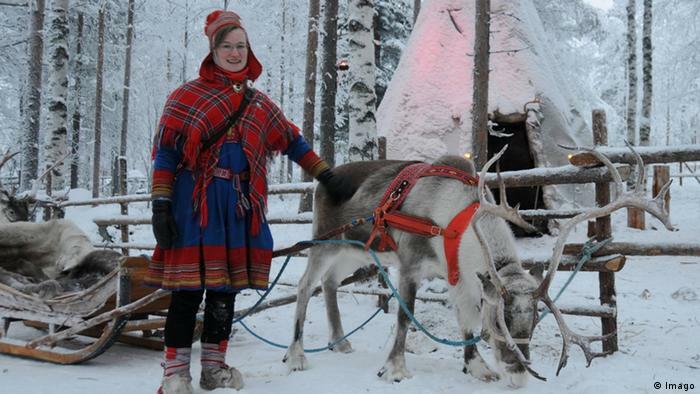 Most people think that there are no indigenous people left in Europe, but there are the Sami (pictured above), who are mainly in Norway. Why do these ethnic groups need special protection? Mainly because they are losing their land. It's worth pointing out that indigenous peoples often feel a close connection to the land and the soil they live on. They often talk about "Mother Earth" - which tells you a lot. It's important for their survival - in a spiritual as well as a physical sense - that they have their own land with a degree of autonomy. But they are increasingly losing that land, as it often contains natural resources like oil, gas, coal and uranium, so there are economic interests there. They often have to defend themselves and have their backs to the wall. They often say "Our land is our supermarket and our church. If we lose it, we lose everything." How do these people live? Are they reclusive, or perhaps living on reservations, or have some of them adapted to modern urban life? There is a great variety, just like in the non-indigenous world. For example, in the rainforest areas along the Amazon, people have chosen to live an isolated life, but there are also peoples who live in both worlds - like the Huaorani in Ecuador or the Ashaninka in Brazil. Among them, there is now a young generation of people who have a good education and who can both uphold the traditional ways of their communities and represent their interests politically and internationally. As the Society for Threatened Peoples, we also often have guests from these indigenous groups who come to Germany and deal critically with development projects in their country. Through us, they hope to make contact with policymakers in Berlin. There is the Indigenous and Tribal Peoples Convention, also known as ILO 169, which is meant to protect indigenous peoples. Why has it only been ratified by 22 countries? We suspect that it is very strongly due to the fear that if the indigenous peoples are taken seriously as a negotiating partner on an equal footing, some economic projects can no longer be carried out as might be desired - as some politicians have argued openly, even here in Germany. There is then a fear of financial losses. So far, Germany has not ratified the Convention either. What is the political mood at the moment? We are working tirelessly toward the ultimate goal of German ratification. By this I mean not only the Society for Threatened Peoples, but an alliance of numerous NGOs, church aid agencies and other groups who have come together in the interest of ILO 169 and are lobbying for it together with receptive politicians. There have been several times in the past when the German government was ready to ratify it, but it always failed because of a change of government. We have a good base of support with the SPD and the Greens, and it will surely not be long before the issue comes up again. What is the German government now doing to ensure the protection of indigenous peoples? It says that it is committed strongly to working at the UN level. I certainly believe that the colleagues there are working with a sense of goodwill. But there's still little sign that the interests of the affected people are taken seriously. For example, there's the highly controversial Belo Monte dam in Brazil, where German companies are earning money by building the pipeline, as they are with the pipeline in Ecuador, which was partly finaced by German bank WestLB. The pipeline has burst several times and contaminated the soil. Another matter is the negotiations on free trade agreements with Canada and the US: Whoever wants to import natural gas from fracking needs to know that this often takes place on Native American land. This year, for the first time, a World Conference on Indigenous Peoples is being held at the United Nations in New York (22-23.09.2014). How did this come about? The conference is taking place now because the UN's Second International Decade of the World's Indigenous People comes to an end this year. It's a kind of closing conference, in which we will assess what has been achieved in the last 20 years, what goals we can still aspire to and how things should go from here in terms of organization. What do you expect from this event? What are you hoping for? The indigenous speakers are already voicing criticism about the way it has been organized. They wanted to take equal part in organizing it, but they are not sitting together with the others on the podium. This is about their rights. They have complained that they feel excluded. And although this has happened, we can look on the bright side and hope that a mechanism can be found to allow the structures and working methods of the previous two decades to continue. Mechanisms already exist, but they must be further improved. Yvonne Bangert works in the Office for Indigenous Peoples of the Society for Threatened Peoples in Göttingen, Germany.